At RENU Hair and Beauty we offer all aspects of hair and beauty, from stunning hairdressing to beauty treatments and qualified teaching. Our hair and beauty salon always maintains a warm and relaxing atmosphere, providing unisex hairdressing in a setting where everyone is welcome. As a Shrewsbury hair salon, RENU Hair and Beauty always aims to go the extra mile, providing quality and creative hairdressing alongside beauty treatments designed to pamper. Our team understands the latest trends and products, making your inspiration a reality. 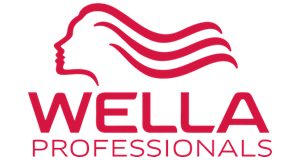 We’ve been established for over 14 years and have built up an established team of experienced stylists, quickly becoming one of the leading hair salons in Shrewsbury. Everything we do at RENU Hair and Beauty is based around you. We’re dedicated to providing a personal service and a bespoke, enjoyable experience. Visit us today and see how we can help you. cuts and hair colouring to Manicures, Pedicures, Gel Polish, Acrylic Nail Extensions and massage, there’s something to suit everyone. Blue Sky ensuring a high-standard of quality. well as haircuts for children. anti-aging properties while our mud wraps help nourish and treat problem skin. Looking to de-stress? Take a look at our massage and holistic therapies, where we can target different areas of the body and help you relax. Hairdressing has been a constant in my working life. I started as an apprentice at the age of 16. By the age of 21 I was teaching Hairdressing NVQ Levels 1, 2 & 3 for County Training. I did this for seven years, working my way up to Salon Supervisor in Ludlow and Wellington. During my years at County Training I was an important part of delivering the Level 1 Provision to 14 - 16 year old's in Telford. I have been in the Hairdressing industry for 22 years and I have owned my own successful business for 14 years. 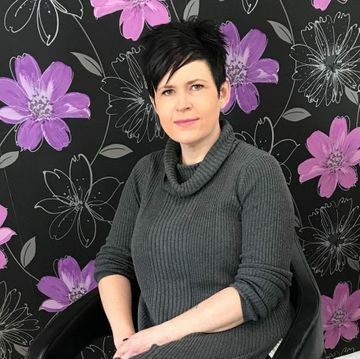 Within recent years I have concentrated on growing my hair and beauty salon while delivering training for hairdressing apprentices, allowing me to keep up assessment practice. I have a passion for Hairdressing and teaching and love watching learners progress in our industry. I first found my interest in hairdressing when I was in my last two years of secondary school, where I studied Level 1 Hairdressing. After I completed this qualification I went on to be an apprentice at RENU Hair and Beauty. Here I assisted in the day-to-day running of the salon whilst completing my Level 2 NVQ in Ladies Hairdressing. I did this at the salon 4 days a week and 1 day at college where I carried out my theory work and sat my exams. Once I’d completed my qualification I continued to work at the salon full-time as a junior stylist. I then went on to complete numerous beauty courses which includes manicure, pedicure, waxing, lash and brow treatments, spray tanning and gel polish. These courses were followed by my Level 3 NVQ in Hairdressing. I really enjoy cutting and colouring as it can make a dramatic difference to a client. I hope to progress further in my career and gain my NVQ Assessing Qualification and Acrylic Nail course in the New Year. I have worked in the hairdressing industry for 28 years, starting as an apprentice before gaining my City and Guilds Level 2. I decided to upgrade my Level 2 Hairdressing and went on to complete my Level 3 Hairdressing. I have always enjoyed tutoring so completed my assessor's qualification which enables me to deliver NVQ qualifications to learners. In an effort to keep advancing my skills, I have also completed my Key Skills Maths and English Level 2. I have also taken a keen interest in Beauty, completing the GTI Professional standards, Waxing, Manicure and Pedicure. I enjoy working in a busy, varied salon where no two days are the same. I enjoy making clients look and feel special when they leave the salon. I began my journey in the Hair & Beauty industry as a Hairdressing apprentice at a salon in Shrewsbury in 2013. I worked full-time and attended college one day a week to complete my Level 2 NVQ Diploma in Ladies Hairdressing. 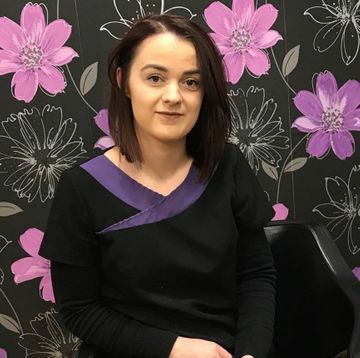 After completing my hairdressing apprenticeship, I stayed on to work at the salon and later decided I wanted to progress further and decided to complete my Level 2 Beauty Specialist course to work alongside my Hairdressing. 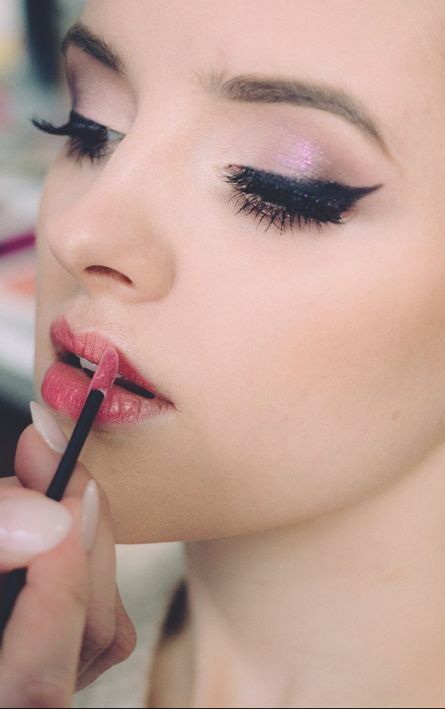 I found a real passion for my beauty work and knew this was more for me. 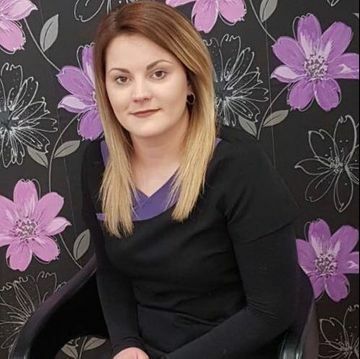 I am now the beautician at RENU Hair and Beauty part-time whilst completing my Level 3 Complementary Therapies to add to my knowledge so I can share this with my clientele. I enjoy all aspects of Beauty Therapy but especially Nails, as they can be as subtle or vibrant as your client wants. I am also busy perfecting my Nail Art techniques. At RENU Hair and Beauty we can also help you begin your training within the hair and beauty industry, delivering professional and accredited Beauty, Nail and Holistic training courses. We successfully train young people who are experiencing difficulties with their education. Our packages are bespoke, designed to meet the needs of the individual. We are now proud to be able to offer GOVERNMENT FUNDING to our learners (subject to eligibility). This means depending on your circumstances we are able to access a variety of funding options for our learners so there’s never a better time to start on your hairdressing or Beauty career. Whether you are 16-18 starting out after leaving education or a mature student who now feels it’s the right time to tackle something new we have the career path for you. Our learners all develop their skills in a realistic working environment. We support people to value the key workplace skills of enthusiasm, self-motivation and independence. At the RENU Training Academy, we can help learners begin working towards their accreditation in Hairdressing, Beauty and Nail Art via the AQA Unit Award Scheme, with opportunities for embedding in core skills ‘or work towards completing their full NVQ qualification in Hair or Beauty. All of the work completed at RENU will help learners move onto a NVQ qualification or employment. Each training course take place in a friendly and professional environment, providing practical training with tutors that have over fourteen years of experience in the industry. We also deliver the AQA Unit Award Scheme for students within the care sector or EBD schools, offering an opportunity to learn new skills in the hair and beauty industry. After successfully completing units from the AQA Award Scheme, we will assess the correct level of VRQ or NVQ your learner can progress to. We are proud to be able to offer this to our learners, encouraging them to continue being motivated and open to learning. With a nationally recognised qualification from VTCT, the countries leading awarding body for the Hair and Beauty Industry, your learner can gain access into college to further their career opportunities. We all understand learners can find working in a classroom daunting, which is why here at RENU we do the opposite. All learners are integrated with members of staff and clients, so they feel part of the team. Contribute to the development of effective working. Assist with salon reception duties. Are you a person who has a flair for creativity and enjoys working as part of a team? Quality trained hairdressers are always in high-demand and here at RENU we can help you on your career path. Your training will take place within a modern, fully-equipped Hair and Beauty salon using the latest tools, equipment, products and techniques. Our tutors have over 50 years of combined experience in the Hair and Beauty industry. They are here to guide and inspire you to help you reach your full potential. We will help you from day one of our journey to completing your Level 2 Diploma and onto your Level 3 Advanced Hairdressing. At Renu Training Academy we offer the NVQ Level 2 Diploma in Hairdressing in such a way it saves a lot of time in comparison to Further Education colleges. It's perfect for those looking for a career change or wanting to freshen up their skills when returning to the industry. Students can train and become a qualified Level 2 Hairdresser within 26 weeks on a part-time basis. 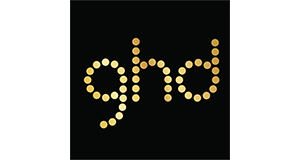 Level 2 Diploma in Hairdressing: £1,750 which includes registration fees, salon tunic and teaching fees. Additional fees: Hairdressing kit approximately £120. To help with the training costs we can agree on a fixed monthly repayment scheme at 0% interest. Give customers a positive impression of yourself and your organisation. Then upon a discussion with your tutor a decision will be made on what optional units to choose. Training and assessment will take place in our fully working hair and beauty salon on real clients. Will I be required to do home study? Yes, as you learn your new skills you will need ot practice on friends and family. Written assignments and research will also need to be carried out in your own time. Here at RENU we believe quality time is the key to quality learning. Our class sizes are purposely kept small to keep this ethos. Our normal class sizes are 8 - 9 learners. Color hair using a variety of techniques. Creatively style and dress hair. Assessment takes the form of observation of practical competence within the commercial salon; which is then backed up with written assignments and questioning to assess knowledge. Practical assessments are completed on paying clients and must be completed within a commercially viable time as stated in the NVQ. Will I be required to study at home? Yes. As you gain new skills you will need to practice on friends and family. Written assignments will need to be researched and completed at home as well as in the training centre. To provide quality training we believe in keeping classes small to provide quality training. Therefore, there will not be more than 8 - 9 learners at any one time. All of our courses are accredited by VTCT, enabling you to gain employement in the hairdressing sector. The price of this course is £2700 which includes registration, teaching fees and the purchase of a salon tunic. You will be required to bring your own tools. If this is not possible, a kit can be purchased from us at a fee of £120. All fees can be paid in installments over the duration of the course. Are you interested in beginning a career in beauty therapy? There will be then be an opportunity for you to choose other optional units to make up your qualification, this will be discussed with your tutor to complement your training, the optional units are; themed face painting, the art of photographic make up, nail art application, presenting a professional image in a salon, salon reception duties. Your training will take place in a fully commercial hair and beauty salon. Once level 1 is completed there will be an opportunity to progress onto your level 2 in beauty therapy. The level 1 certificate in beauty therapy qualification is completed at your own pace you can attend anything from 1 day to four days per week. The cost of the course is £1000 which covers all registration fees and a salon tunic. This can be paid via monthly instalments which are interest free. NVQ Level 2 Diploma in Beauty Therapy General. Are you a person who has a flair for creativity and who enjoys working as part of a team? Quality Beauty Therapists are always in high demand and here at RENU we can help you on your career path. Your training will take place within a modern fully equipped Hair and Beauty salon using the latest tools, equipment, products and techniques. Our tutors have over 50 years combined experience in the Hair and Beauty industry. They are here to guide and inspire you to help you reach your full potential. We will help you from day one of your journey to completing your Level 2 Diploma and onto your advanced courses. At RENU Training Academy we offer the NVQ Level 2 Diploma in Beauty Therapy in such a way it saves a lot of time in comparison to Further Education colleges. It’s perfect for those looking for a career change or wanting to freshen up their skills when returning to the industry. Students can train and become a qualified Level 2 Beautician within 26 weeks on a part time basis. Prerequisite: None. This qualification is ideal for those just coming into the industry. Level 2 Diploma in Beauty Specialist Techniques: £1,750 which includes registration fees, salon tunic and teaching fees. Additional fees: Beauty kit approximately £120. To help with the training costs we can agree on a fixed monthly repayment scheme at 0% interest. This is made up of 9 mandatory units and a selection of optional units to suit your requirements. Provide facial skin care treatments. Promote additional services and products to customers. Ensure responsibility for actions to reduce the risks to health and safety. Training and assessment will take place in our fully working hair and beauty salon on real clients. Yes. As you learn your new skills you will need to practice on friends and family. Written assignments and research will also need to be carried out in your own time. Here at RENU we believe quality time is the key to quality learning. Our class sizes are purposely kept small to keep this ethos. Our normal class sizes are 8-9 learners. (Mandatory) Create a Hair and Beauty image using colour. (Optional Units) Hand and Nail Care, Foot and Toenail Care, Makeup Application, Nail Art, Skin Care, Customer Service, Health and Safety in the Salon, Blow Dry Hair. The Unit Award Scheme is ideal for any learner who has missed education for any reason. Our belief is anyone can be a learner w just need to find an interest. 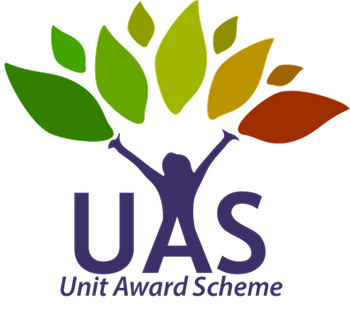 The Unit Award Scheme has over 10,000 different units to choose from whether it be Maths, English, Science, Hair or Beauty we will find the right course for your learner. We are not a ‘school’ we are a training academy and our learners love our ethos. We believe we are all in it together, with this in mind we all integrate together there is no ‘teacher’ and no ‘child’ we are all members of staff. Once our learners start achieving units this gives them pride and self-belief which in turn creates self-motivation. We know by promoting this we get great results and our working partners agree. "I have been very impressed with the Academy... with sensitive teaching approaches and individualised learning, I can highly recommend them to any organisation who may be looking for this type of provision" - Alistair Craib, Keys Childcare. "The team at RENU are a joy to work with - very professional, flexible, contactable. Pupils from our school... have gained skills to assist in their future careers. They have also gained life skills such as increased self-confidence and an ability to deal with real-life situations" - Anna Liddell, Pastoral Lead Teacher, Access School Shropshire. "I am proud to have worked with Gail and the RENU team. 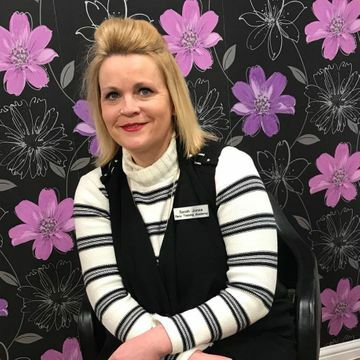 Gail's experience in the hair and beauty sector, together with her background of NVQ assessing for County Training, assures learners of an exceptional training environment." - Jason Manley, Director, Jump Learning UK Ltd. If you have any questions or wish to book an appointment, you can get in touch with us with on 01743 718586. Alternatively, please contact us using our contact form to the right.